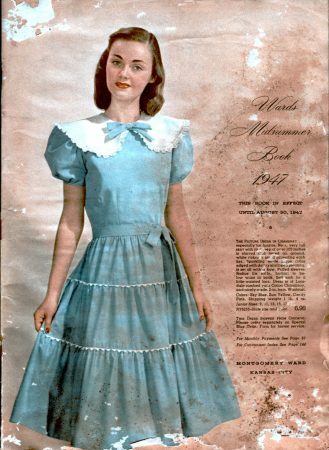 You can be forgiven for not recognizing the main item pictured on this page of the 1947 Montgomery Ward Midsummer catalog. 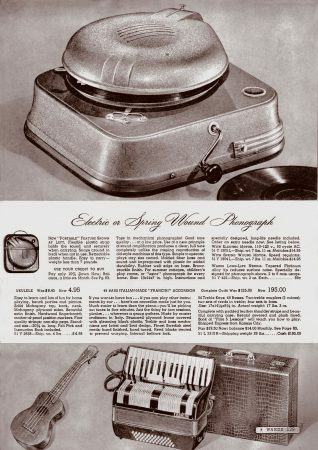 What looks like the spawn of a waffle maker crossed with a flying saucer is actually a phonograph for playing 78rpm records. Modern as it may appear – complete with plastic carrying strap – a year later the 33 1/3 LP would start this phonograph down the road to oblivion. But still…it included a version that required absolutely no batteries or electricity. You won’t find many music playing gadgets today that can make that boast. Unless of course you’re talking about musical instruments, which Wards also offered in that summer of 1947. For one there was a solid mahogany Ukelele – “easy to learn and lots of fun for home playing, beach parties, and picnics.” No doubt. And cheap at $4.95. But if you REALLY wanted to be the life of the party, then you what you wanted was an Italian-made accordion “much easier to learn than the piano – you’ll be picking out tunes in five minutes. Just the thing for jam sessions, picnics…wherever a group gathers.” Ummmmm, yes, undoubtably there were a lot of hot jam sessions with musicians crying out for a good accordion player. As a further mystery, the accordion came with a “Keratol-covered case.” Back then Keratol seems to have referred to a sort of leather-like substance. Today, Keratol is a steroid cream – which is not the sort of thing you would wrap your accordion in and expect to be the life of any party.